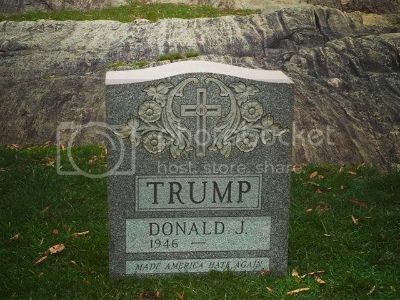 Artist Brian Andrew Whiteley’s “Trump Tomstone,” a fake tombstone belonging to the Republican presidential candidate which caused a media frenzy when it appeared in Central Park in March, will go on display Friday at an art gallery in Brooklyn. The mock tombstone — which features the name “Donald J. Trump” alongside the date “1946 — ” and the epitaph “Made America Hate Again” — will be on display at the Christopher Stout Gallery in Bushwick beginning Friday and running through Sunday, October 9, according to the gallery’s website. The tombstone first appeared in the middle of the night one night in March, just after more than a thousand activists and supporters of Bernie Sanders’ presidential campaign had participated in a demonstration in Central Park, as Breitbart’s Lee Stranahan reported. In a brief interview with the New York Daily News this week, the 33-year-old Whiteley said the tombstone — which was seized and later released by the New York Police Department and led the Secret Service to visit the artist —&nbsp;was intended to make a “pointed statement” about the “hateful” nature of Trump’s campaign. Yeah, the "hateful" nature of the Trump campaign. Don't you just hate it? Bankrupt artist making a name for himself with snark. Laugh everyone! not!